My second sandwich of the week is a falafel and roasted red pepper stack. I'm doing a week of sandwiches. I started yesterday with a veggie Leerdammer BLT and this is my second sandwich idea. 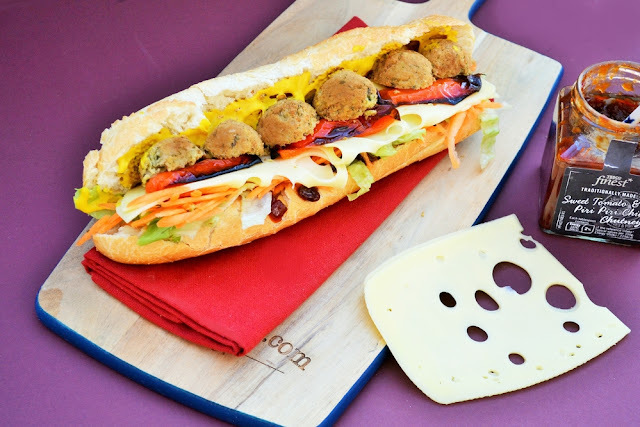 The idea for a week of sandwiches came from Leerdammer, who challenged me to come up with new sandwich ideas using their handy sliced cheeses that combine the mild flavour of Gouda with the large holes of Emmental. Let's face it we all get in a lunchtime rut. I know I do. This is rather large, so it's a perfect lunch to share, or just cut it in half and keep the second half for the next day. You may notice that wee jar in the background. It's Tesco Finest Sweet Tomato and Birds Eye Chilli Chutney. I just discovered it this week. It's great for perking up sandwiches. Not too hot, but has a great flavour. A deep stacked sandwich featuring red pepper, falafel and Leerdammer sandwich slices, lots of salad, mustard and chutney. Pimp up your lunchtime. 1. Once the baked baguette is cool, slice down the middle and spread chutney on the bottom half and top with lettuce and carrot. 2. Top with the slices of Leerdammer, red pepper and falafel. 3. 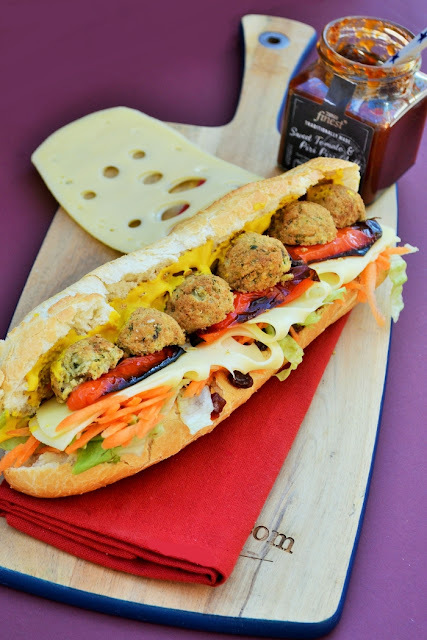 Grind some black pepper over your sandwich fillings, then drizzle some mustard over the top half of baguette.4. Cut in half and serve.5. Enjoy!Notes: You can use fresh baguette for this sandwich. I find part-baked baguettes are handy to have on standby and save an extra trip to the bakery. I hope I've inspired you to try something new for lunch this week. Tune in each day for more lunchtime inspiration and follow my Pinterest Board Sandwiches - make lunch special. I love Falafels and I love Leerdammer but would never have thought to put the 2 together! You know you have to try it now, don't you Camilla? It looks like such a delicious baguette, stuffed to the brim! I would switch the cheese though, am not so keen on leerdammer... That chutney sounds good, I do like a bit of bite to my pickles and can imagine it working with the falafel well! Stack it up Anne and use your favourite cheese. That's quite a sandwich! I bet the falafel and cheese is a really tasty combo.